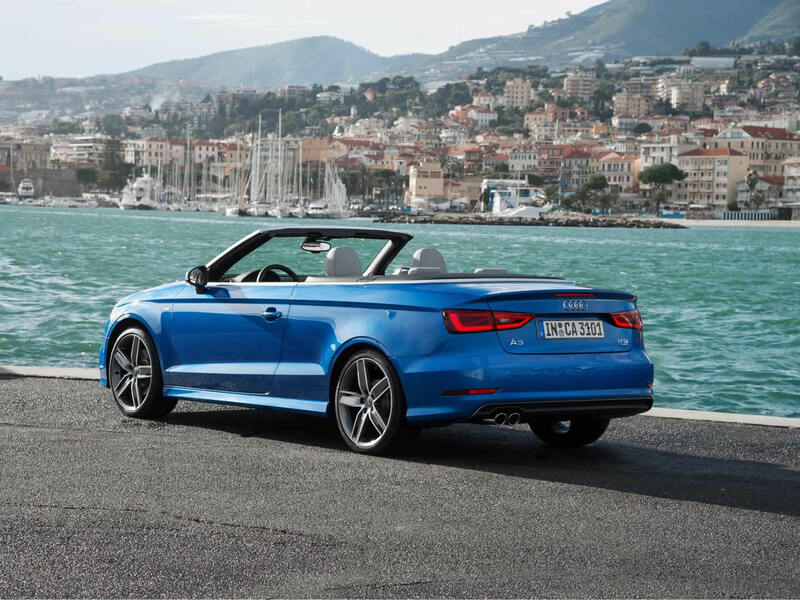 Using the versatile MQB platform, the second-generation Audi A3 Cabriolet is larger and more elegant than the car it replaces. 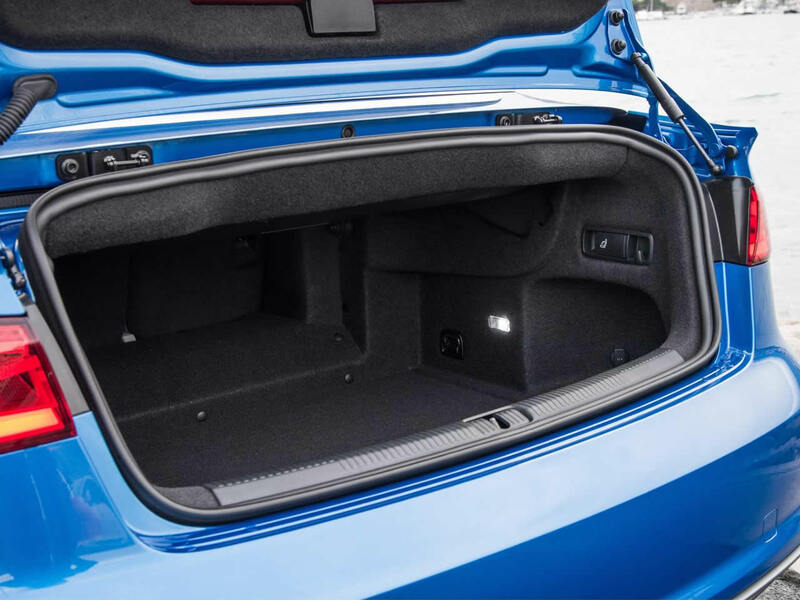 The cut-off hatchback style rear end is gone and luggage and interior space have increased accordingly. It is a more handsome car as a result and yet next to the longer A5 Cabrio it remains a more chunky design. Build quality is excellent as you might expect and the interior is beautifully finished if not particularly innovative in its layout. Luggage space is further improved by using the split-folding rear seats. The Audi A3 Cabriolet’s fabric roof folds in 18 seconds at speeds up to 31 mph and there isn’t much wind buffeting to deal with when it is down. Interior wind movement is further reduced by the fold-out wind deflector although this does use up the rear seats. 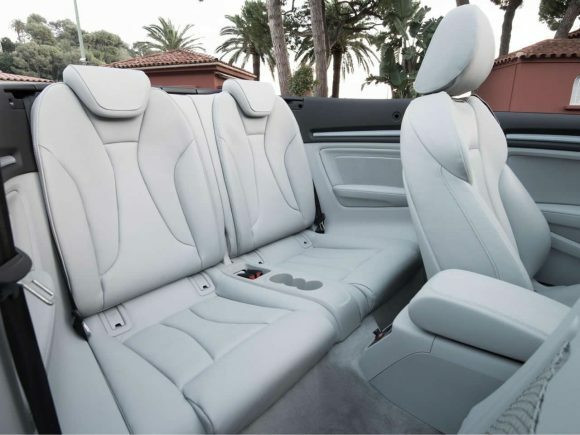 An optional active seat ventilation system (following Mercedes’ Airscarf) increases comfort in the front seats on cooler days by blowing warm air on the back of occupants necks. There is also a thicker acoustic convertible roof available to further reduce road and traffic noise. Audi's new 1.5 litre TFSI engine replaced the reliable 1.4 which had become a bit of a favourite among customers for its zingy performance and great economy. The 1.5 doesn't seem to be much of an improvement but thankfully seems to provide a similar character. The 2-litre TFSI engine replaced the older 1.8 TFSI. The new engine is both more powerful and more efficient. It comes in standard (front-wheel-drive) and Quattro drivetrains. 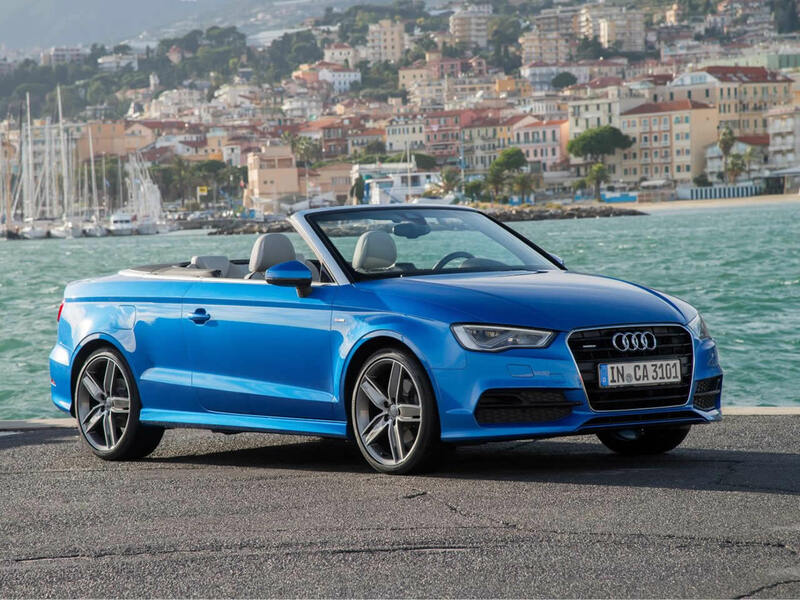 The most frugal car in the range, the Audi A3 Cabriolet 1.6 TDI sips at its diesel fuel making pit-stops a rarity. Performance is a little pedestrian but if fuel economy is your aim you won't be driving hard anyway. 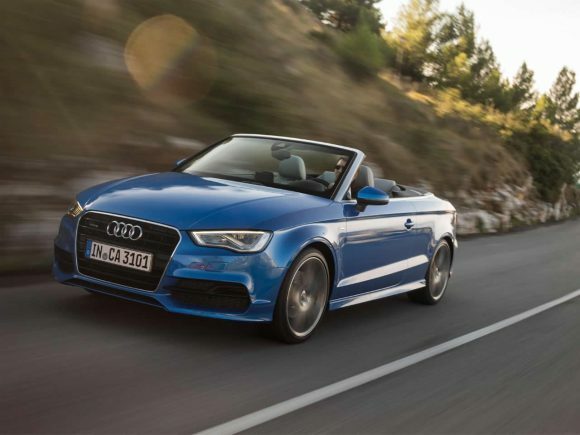 The diesel power for the Audi A3 Cabriolet 2.0 TDI provides refined torquey performance. It is more efficient than the petrol alternatives, but it is up to the driver to decide if the diesel engine sound is worth the cash saving. At speed, it is smooth and quiet but at tick-over and around town the sound is more prevalent. Performance is good with brisk acceleration and effortless high-speed cruising. If long journeys and high mileages are your thing, then this is a car well worth considering. The more powerful version of the 2.0-litre TDI comes with either front-wheel-drive and manual transmission or the Quattro all-wheel-drive system with the S tronic dual-clutch gearbox. We're still getting used to the idea that you can get peppy performance from a small engine in a solidly built car but the Audi A3 Cabriolet 1.4 TFSI is a perfect example. The entry-level car has a turbocharged engine that gives levels of power and torque equal to that of a 2 litre car in normally aspirated form. The benefit is that it is a smaller, lighter engine that is far more fuel efficient and produces lower emissions. Despite having squeezed so much extra horsepower from the little engine, it never complains and runs smoothly and quietly even at high speeds. It may not be an out and out sports car but there is plenty of go for most drivers and the tight front wheel drive chassis gives a nice responsive feel. Performance improves considerably on the previous 1.2 litre entry-level Audi A3 Cabrio while efficiency is clearly better than the BMW 1-Series or even the VW Golf Cabriolet. To many the 1.4 TFSI A3 will be the best balance of price and performance with the diesel alternatives being a little less refined and offering only a little reduction in running costs.In some regions, a less powerful and efficient 123bhp/125Nm version of the Audi A3 Cabriolet 1.4 TFSI is available. The 1.4 was replaced by the 1.5 TFSI in 2017. The convertible A3 launched with the Audi A3 Cabriolet 1.8 TFSI as the performance model. The turbocharged engine delivers ample power throughout the rev range providing good acceleration in every gear. It comes with the fast paddle shift twin-clutch seven-speed S-tronic gearbox as standard. While the 1.8 TFSI may not offer the performance of the S3 models it is sure-footed, fast and a pleasure to drive. The rigid underpinnings make the A3 Cabrio a competent performer however the steering is not particularly communicative. The result is a fast GT rather than an edgy sports car which day to day will suit many drivers better. Do you drive an Audi A3 Cabriolet? Would you recommend it to others? Join the conversation and let us know what you think of the car. This Audi currently has 2 owner reviews. This is an incredible drop top, but when it comes to warding off the wind noise and buffeting, I prefer my retrofitted additional windstop rather than the bulky factory fitted two-fold one, and now backdraft and shuddering have literally come down to zero. Yes, wind buffeting will come down only if a wind deflector is mounted; in fact, it is a must to mount a draught-stop to keep the air turbulence in check and enjoy noise-free al fresco rides. Well, I have installed a wind deflector and there’s no tangible wind noise even on motorway speeds!